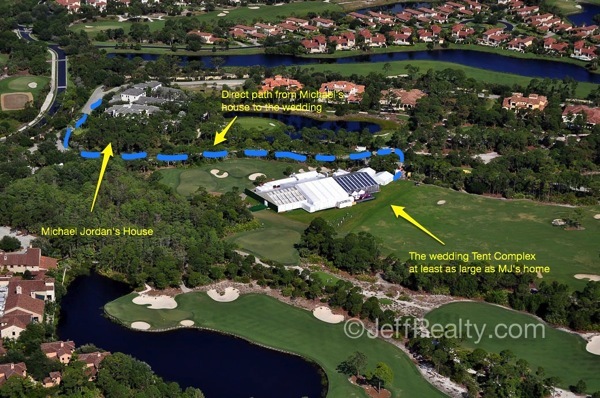 Michael Jordan’s Wedding Tent is 40,000 sq ft, 5000 sq ft larger than his 35,000 sq ft home in the elegant and classy Bears Club in Jupiter, Fl. As you can see from the aerial, Jack Nicklaus has graciously allowed Jordan to place the largest tent in wedding history on the driving range of his renowned golf course in order to house the only 2,200 invited guests! 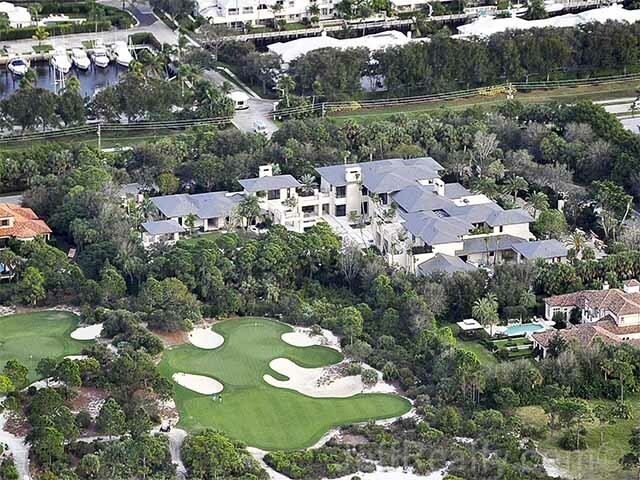 Guests included former Bulls player Scottie Pippen and Toni Kukoc, Spike Lee, Patrick Ewing and nearby neighbor Tiger Woods ( view tiger woods Jupiter island home) The entertainment included DJ MC Lyte, singers K’Jon, Robin Thicke and Grammy-Award winner Usher and The Source, an 18-piece band. Jerry Krause was nowhere to be found. Watch Jeff interviewed on Access Hollywood on National TV about the wedding. Jordan is set to marry the drop dead gorgeous Yvette Prieto, a Cuban born super-model. It is the 2nd marriage for Jordan and the first for Prieto. The sound system for the affair arrived in four semi-trailers and the band spent the entire day Friday rehearsing for the BIG EVENT. Golfers had a great time on the course, with a backdrop of music to play to or dance between shots. Best yet, MJ won’t even miss a day of work as his Charlotte Hornets missed the playoffs! The wedding site is in easy walking distance from Michael’s house. 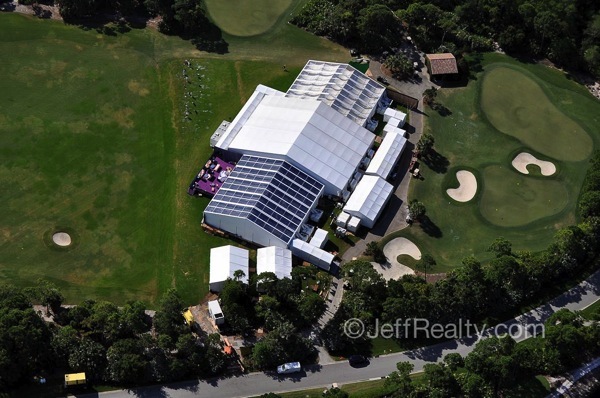 In the aerial above, you can see regular club members getting in a last practice round before the event. Just around the corner lies Michael’s house although the setup is clearly not designed to “invite” people to move back and forth between the house and the wedding. 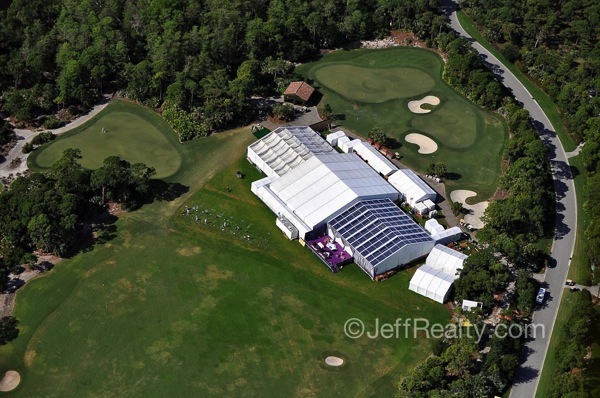 At the rear (right side of the photo) of the tent complex, appears to be men’s and women’s temporary restrooms which is probably the limit of where guests will be allowed. The layout of the wedding tent structures appear to invite guests in on the left to a reception area followed by a main area where the ceremony is likely to take place along with dining afterward – and finally an enormous ballroom and dance floor already darkened with paneling to allow for lighting and effects to go along with the music. You can see the band stage (in purple) were curtains can be opened at the right time to allow people to see and hear the band perform. The wedding itself cost a reported $10,000,000!!! Amazing floral arrangements with tulips, roses, peonies, crystal candelbras, private cigar rooms, Usher, and of course the tent structure quickly add up. Yvette looked gorgeous in a French silk J’Aton Couture wedding dress with Swarovski crystals. Buses were brought in to drive people from the nearby church to the wedding reception. Everything was kept very hush hush for a Michael Jordan wedding. In a town with the Donald, this was one affair that Trumped Trump! 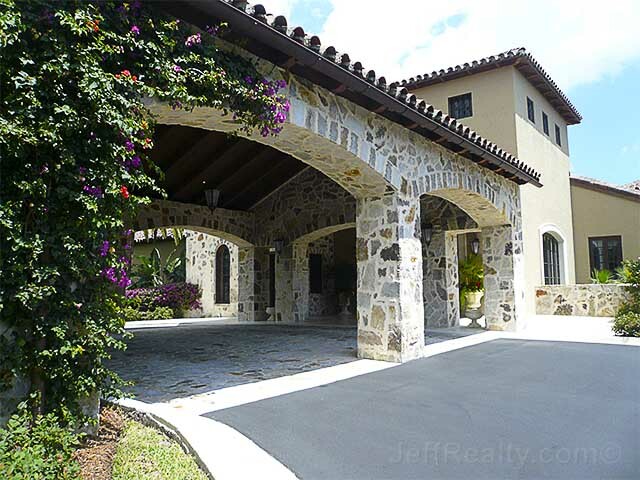 Some information on Michael Jordan’s home… The Jordan house makes a clean break with the Mizner Traditional Mediterranean architecture so familiar to the Palm Beach area for the past 80 years. 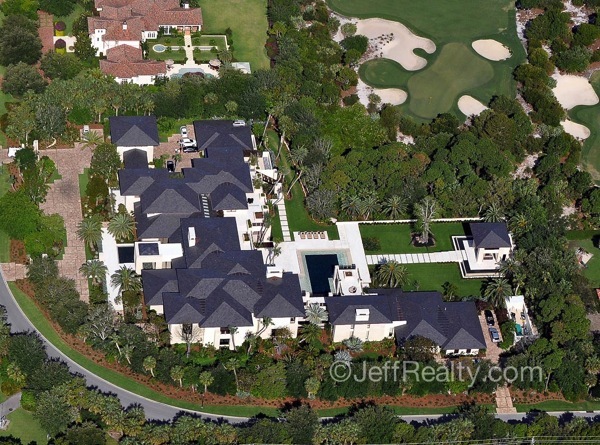 Other celebrities are breaking out as well in this direction, as evidenced by Rory McIlory’s and Tiger Woods’ houses. Architecture is much more open, meaning that rooms are less defined by walls and more defined by furniture layout. Living rooms in many cases have disappeared completely and great rooms have emerged with 80″ TVs and open kitchens. The outside is now part of the inside. The Jordan house counts 18 separate roof structures that break the massiveness into houses within houses. It is so tastefully done, the architecture is brilliant, as there is an intimacy uncommon with size. The Bear’s Club, developed by the world’s greatest golfer, Jack Nicklaus, is now home to the world’s greatest basketball player, Michael Jordan. 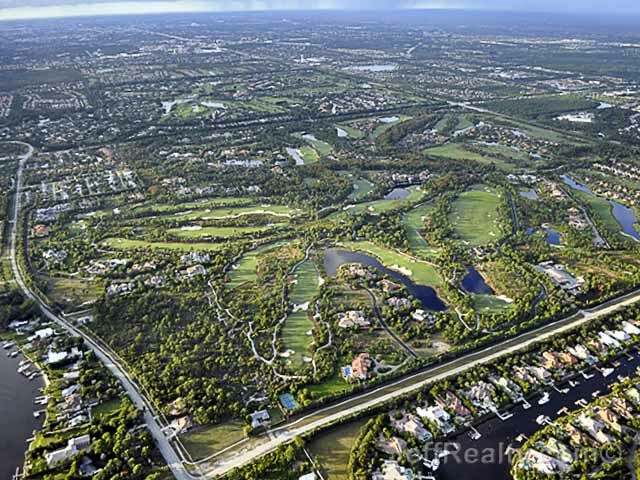 The Bear’s Club was just a huge empty piece of land for years with a few cows and a lot of barbed wire owned by John D. McArthur until it was sold to Jack Nicklaus who had a dream for his ultimate golf course community. 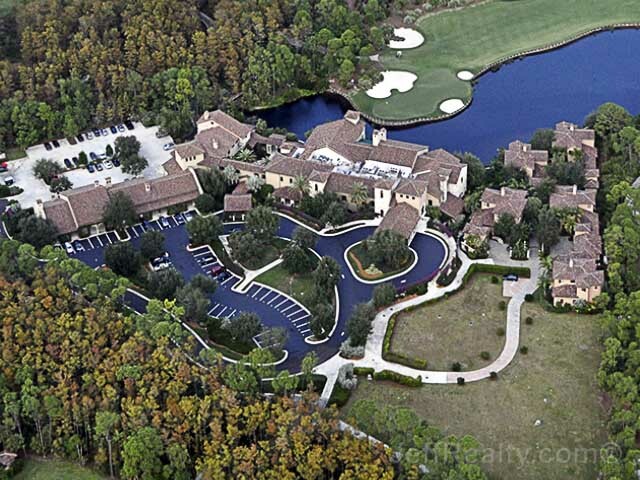 Jack Nicklaus later split the parcel into two pieces and developed the 2nd parcel into the Ritz Carlton of Jupiter, now the Trump National Golf Club of Jupiter. 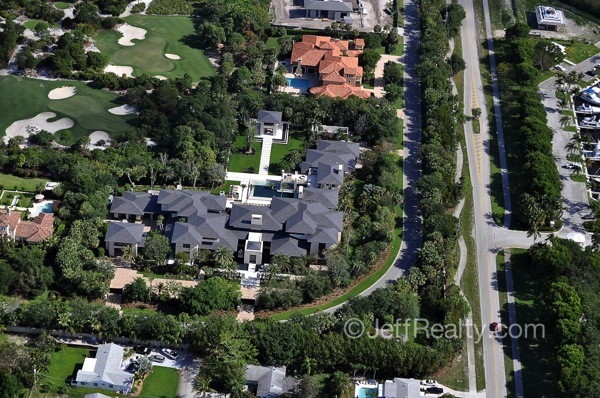 While The Bear’s Club and The Ritz share the same stop light and first few hundred feet, the Ritz home owners drive straight and The Bear’s Club members and homeowners turn right into a magnificent, gated, stoned entry. The caddies at the Ritz, when asked what the difference between the two clubs is, respond that the “Ritz homeowners are all millionaires, but the Bear’s homeowners are billionaires”. While that may not be universally true at The Bear’s Club, they do have more than their share of ultra-wealthy members. MJ’s choice of a 3-acre homesite at The Bear’s Club is not all that unpredictable. His desire for privacy will certainly be well-served there, as entry to The Bear’s Club is well guarded. His home has already been landscaped with a literal forest of trees, giving little or no glimpse of his mammoth 28,000-square-foot home, together with 3 separate structures; a guard house, guest house and pool house. 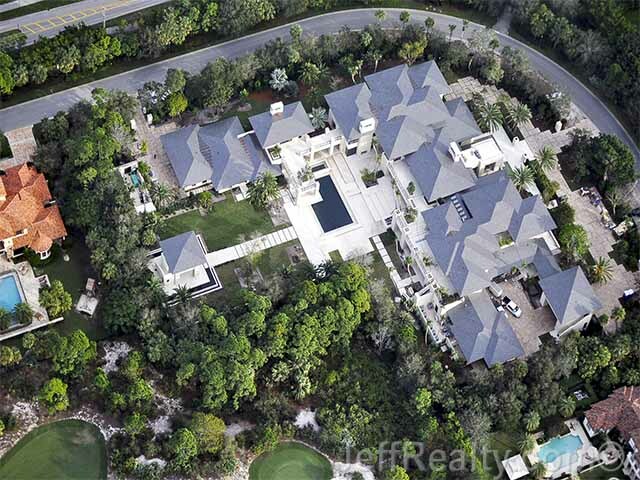 He paid $4.8m for the land and $7.6m for the construction, making this $12.4m mansion probably the most expensive non-waterfront home in the Palm Beaches. MJ’s total commitment when furnished will probably exceed $20m. Micheal Jordan’s House – Check out the HUGE 2nd floor deck!!! 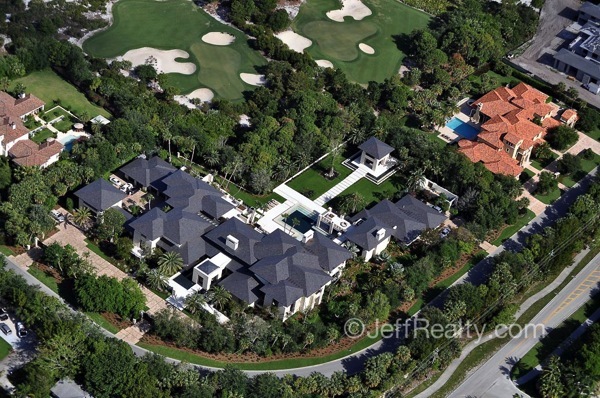 Michael Jordan’s House What is surprising, comparing Jordan’s piece of land to Tiger Woods’, (click here to see Tiger Woods’ Jupiter Island home) is that Tiger put together 3 parcels on Jupiter Island so that he has frontage on both the ocean and the Intracoastal. It would be interesting to see what the Jordan home resells for, being that its location, while great for MJ’s privacy, is not ideal for resale to the trophy and yacht buyer. 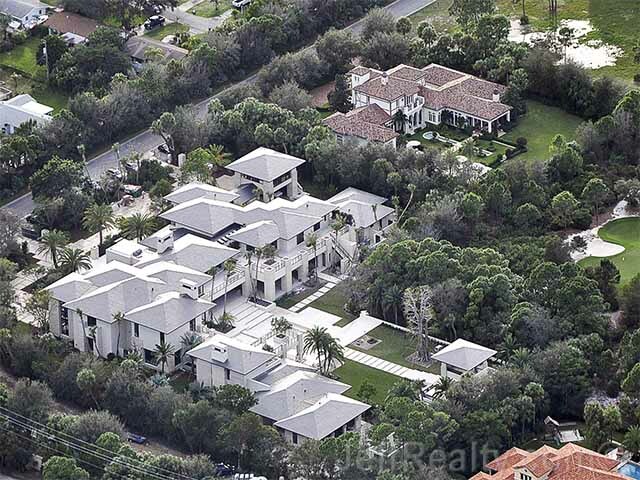 Jordan’s house has 11 bedrooms, 6 on the 2nd floor alone, a 2-story guard house, an athletic wing together with basketball court, and a lavish workout facility. It’s rumored his huge media room with state-of-the-art electronics is ‘cigar friendly’. While MJ loves cigars and gambling, it’s rumored he’s tamed the latter in deference to Jack Nicklaus’ wishes to ‘tone it down’. The Bear’s Club has 55 estate residences, with starter estate homes beginning at $4-5m and the largest homes being priced just under $20m. 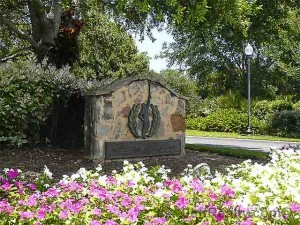 Besides the estate residences, they have 3 other categories, Golf Villas, 14 Club Cottages, and 13 Vintage Estate Homes. 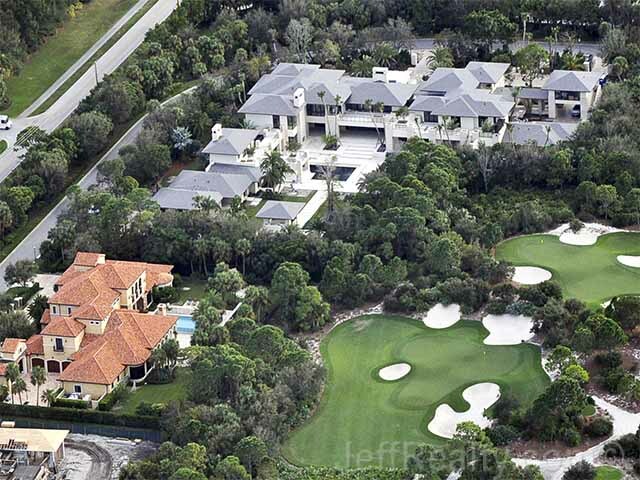 (Click here to see all of Michael Jordan’s new neighbors homes on the market at The Bear’s Club real estate for sale.) The stone-clad Clubhouse is truly magnificent looking, both architecturally and the lush, dark-wooded interior. Jack Nicklaus spared nothing when building this masterpiece, notwithstanding the $90,000 initiation fee and $25,000 annual dues. The golf course is not your typical palm tree lined Florida course; instead, the property is blessed with hundreds of mature pine trees and well maintained scrub that eats golf balls when struck off line. The greens are firm, ultra-fast, and can be treacherous when cut very tight. I played there over a dozen times and always averaged about 3 to 4 strokes higher than my normal score. 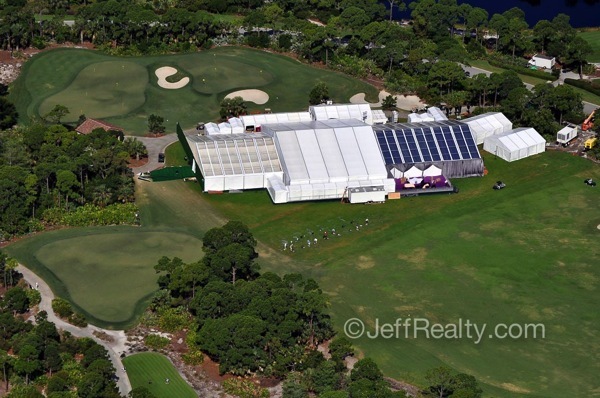 The course has a very high course rating and is fair but on the difficult side. Their caddy program is terrific. Comparing it to Trump National Golf Club of Jupiter, where I was a member for 4 years before 2 back surgeries forced my early retirement from golf, I found the Trump to be a hair easier, maybe 1 to 2 strokes. Jack Nicklaus also designed the Ritz (now the Trump) and made it his chief project to not let it be a lesser course, and he definitely achieved his goal. Both courses are terrific, great challenges, and a joy to play. 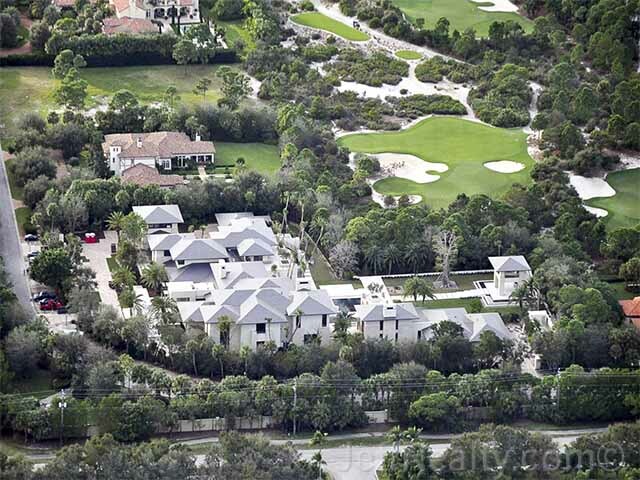 Having built homes in Highland Park, Illinois, I remember when MJ bought his parcel of land in Highland Park and built a 29,000-square-foot house together with a 3-hole golf course in his backyard. MJ had the number 23 on his entry gate. Posted in Bears Club, Michael Jordan on April 27, 2013 at 3:17 pm.